This product is recommended for new designs, although a new version with a smaller form factor and upgraded specifications will eventually replace it. When this happens, no features will be removed, although some new ones may be added. 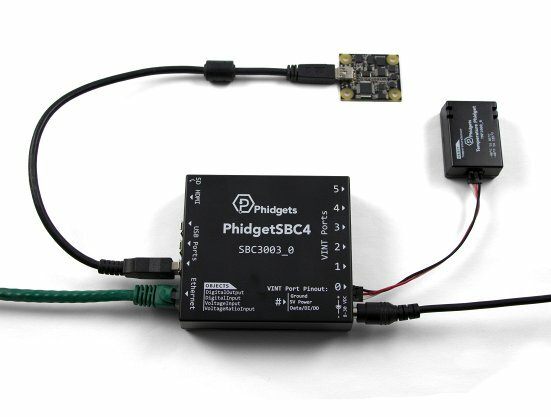 This Phidget requires a power supply between 6 and 30V DC. Select the power supply from the list below that matches your region's wall socket type. Optional: A USB Phidget, VINT Phidget, or analog sensor. 1. If you have any USB Phidgets, VINT Phidgets, or analog sensors, plug them into the SBC now. 2. Connect your SBC to your network using the Ethernet cable. 3. 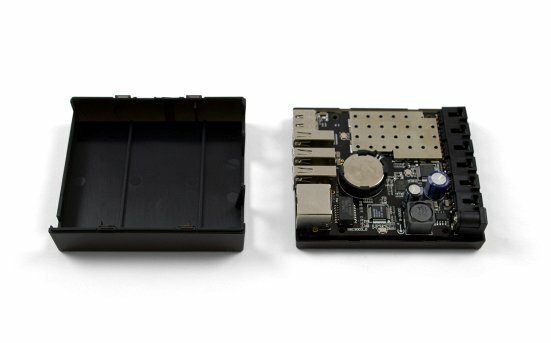 Connect your SBC to power. A red LED will immediately light up underneath the power barrel, indicating your SBC is receiving power. There is also a green LED that will briefly turn on when power is supplied, and then remain on after the SBC has fully booted. Using a Windows machine? Keep reading. The IP address. There is no default IP address, it must be assigned to the SBC. The MAC address. This is useful for distinguishing between multiple SBCs. Next, double-click on your SBC in the Phidget Control Panel. This will automatically open the SBC Web Interface, which, conveniently enough, is our next topic! Jump ahead to the SBC Web Interface. Now that you have the drivers installed, open the Phidget Control Panel by finding the icon in your applications folder. First things first: make sure you have the latest Phidget drivers installed on your machine. Head over to the getting started with Linux section on the Linux page in order to get everything installed. Now that you know the IP address that has been assigned to the SBC, type it into a web browser and hit enter. This will open the SBC Web Interface, which, conveniently enough, is our next topic! The SBC Web Interface is a powerful tool that will prove invaluable when you begin development. You opened the SBC Web Interface in the previous step, so let`s jump right in and set a password! Welcome to the SBC homepage! Here you can view system information such as the firmware version, the amount of storage you have left, and more. Take a minute to look around, and, when you're ready, we will give an overview of the SBC Web Interface, starting with networking. The SBC will try to connect to Ethernet first. It can also switch between Wi-Fi and Ethernet on the fly. If you're following this guide, you've already set up your network using an Ethernet cable by simply plugging it in. Next, we will take a look at setting up Wi-Fi. Add your Wi-Fi network by selecting it from the list, providing any necessary credentials, and clicking the Add This Network button. You don't have to see a network in order to connect to it. You can add the SSID and password of a network, and the next time the SBC boots it will connect to that network if it is available. The SSID settings are only for DHCP networks. Next, we will cover setting a static IP with the SBC Web Interface. Ethernet: Navigate to Network->Settings to set up a static IP. Wi-Fi: Navigate to Network->Wireless to set up a static IP. Now simply enter your network configuration and save the changes. The SBC will immediately start to use the static IP. Warning: setting a static IP improperly can make the SBC very hard to re-connect to depending on the routing within the rest of your network. The SBC has a built in VINT Hub Phidget, so you will always see it on your list of attached Phidgets. 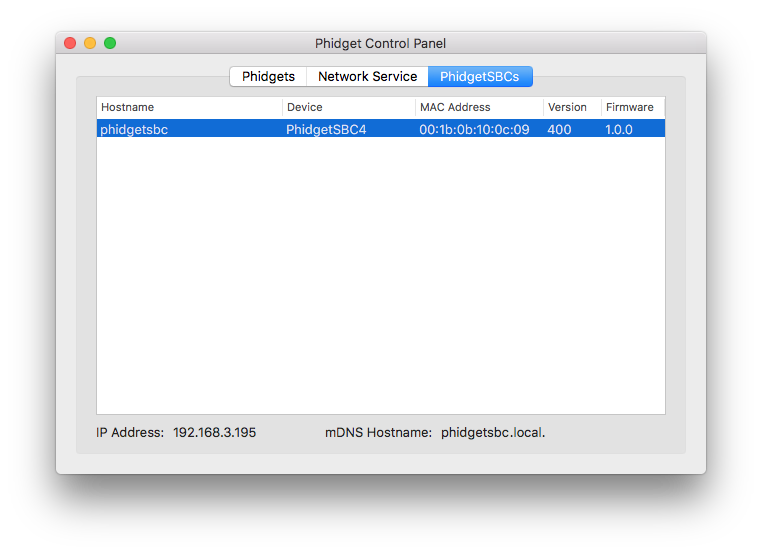 After you confirm which Phidgets are attached to your SBC, navigate to Phidgets->Control Panel. Here, you can test your Phidgets and learn more about their functionality. If you would like to use a webcam with the SBC, ensure it is a UVC (USB Video Class) compatible webcam that supports MJPEG. Next, simply plug it into the SBC and navigate to the Webcam tab. When using a password, the username is webcam. It is recommended to add a password if you are planning to share the stream. Note: the HTTP authentication is sent unencrypted. If multiple webcams are attached, they will start up with the same settings (port number will be incremented for each one). When using multiple webcams, resolution and frame rates will have to be reduced. 1. The Ethernet port is used for network connectivity to the SBC. This enables network access to the SBC as well as any connected Phidgets through the Phidget Network Server. Alternatively, a Wi-Fi USB adapter can be used for wireless network connectivity. 2. The USB ports can be used for connecting Phidgets, Wi-Fi adapters, flash drives, webcams, USB hubs, and other devices. 3. The HDMI connector can be used for connecting a monitor the the SBC. In this situation, the SBC will function like any other Linux computer. (Note: you must plug the monitor in before powering up the SBC in order for it to be recognized). 4. Six VINT ports, essentially an integrated VINT Hub Phidget. 5. The SBC is powered from the barrel jack connector. 6 These LEDs indicate the status of the SBC. The red LED indicates that the SBC is receiving power. The green LED indicates boot status. The green LED will turn on and off once during boot and then remain on while the SBC is running. 7 The micro SD card slot. Each USB port has 500 mA available. 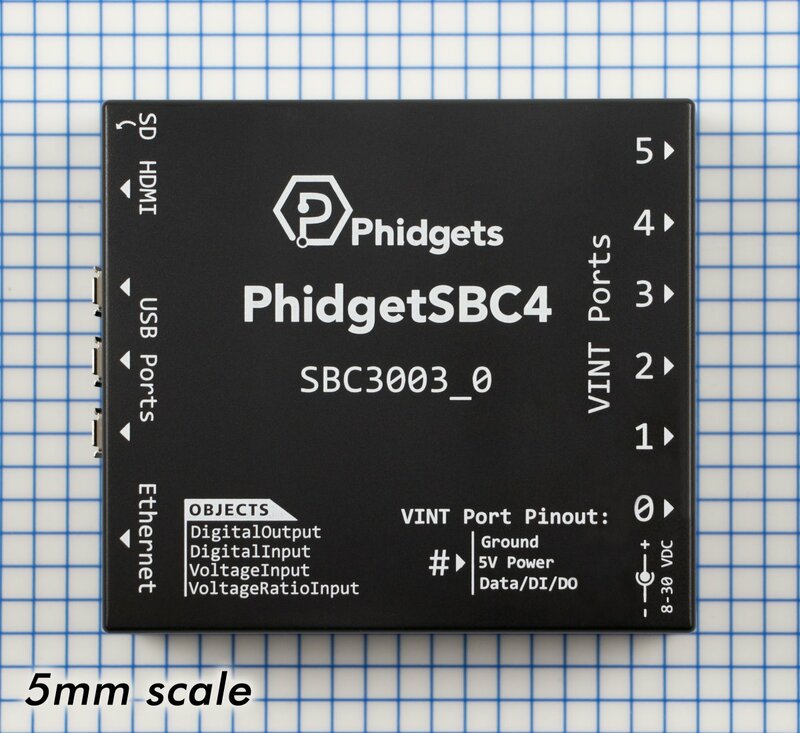 The bulit-in VINT Hub Phidget has 500mA available. The SBC is built around the A20 processor. This is an ARM Cortex-A7 based microprocessor from Allwinner Technology, which runs at 1 GHz. Connected to this is 512 MB of DDR3 SDRAM, and a 10/100baseT Ethernet controller. The microprocessors USB Host port is connected to 3 USB 2.0 High Speed ports. The PhidgetSBC runs Debian/GNU Linux 9.0 as its operating system and gets booted with U-Boot. The date and time are set using NTP (Network Time Protocol) at boot. A NTP daemon continues to run in the background and will periodically update the clock, ensuring the time is always accurateN. There is a real-time clock with battery backup which will preserve date/time across reboots and power removal. If power is suddenly lost, the real-time clock may not have the correct time. The configuration system used by the SBC Web Interface is stored in /etc/webif. It is not recommended to modify these files. The SBC3003 does not natively support factory reset functionality. However, if your SBC3003 becomes corrupt and needs to be reset to factory firmware, you can write a new image to the micro SD card (or a new card) to similar effect. 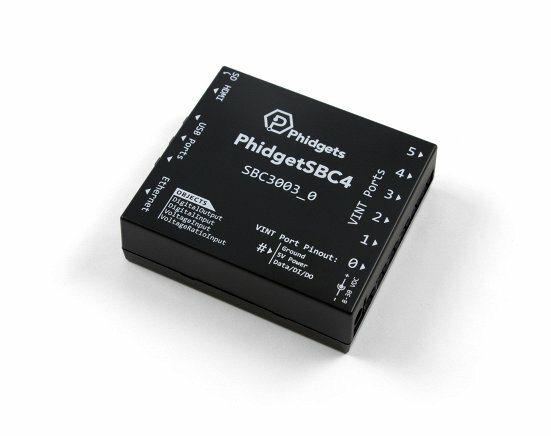 Check the Phidget SBC page next for a guide on how to start writing your own programs, and more!